Mission: To adopt animals into responsible homes and vigorously promote the importance of spaying/neutering all pets. To provide shelter and kindness to homeless and abused animals. To foster humane education and cruelty programs, hoping for a kinder environment in which to live. We are a private non-profit Humane Society serving Warren County’s animals. We promise a second chance to the homeless animals in need of our services. It was a warm day on September 13th, 2018 when two of my friends and I were running around the Gravel Gulch Campground. We wandered far from our trailer, and found ourselves in the yard of a nice lady who seemed to think I was hurt. She gave me food and told me she had to call for help because my legs were injured. I couldn’t tell her that I was born this way, with one front leg shorter than the other and ending in two feet, and one back leg grown curled towards my belly on a stump. It was no big deal to me, but boy did she seem taken aback! Soon, another nice lady in a big white van came and took me to Paws Along the River Humane Society. Everyone there made a fuss over me. Being a yellow lab, I know I am a beauty, but they made me feel extra special. I felt like a princess. I had no license, tags or ID of any kind and could not tell them where I lived or my name. They took me to the Pet Animal Hospital in Jamestown to see Dr. Swanson, a very tall man with a nice smile. He was so amazed at how I walked; mostly on my two good legs and using the other two to help me navigate where I was going. He checked me all over; ears, eyes, teeth and everything in between. I had never been to a doctor before, so it was a new experience. During his examination, he found that I was underweight and had parasites inside me. (Yuck!) My legs were still of some concern, but after the exam he said he thought I would bring smiles and sunshine to anyone who met me. He suggested that my name be “Sunny”. From that day on, it was. After 10 days, I heard the staff say that a woman who said she owned me was coming to get me. She never came though, and finally she decided it would be for the best to give me to PAWS to find me a new home. The staff continued to dote on me, and I loved all the attention. They told me they would find me a good stable home, something I had not had before. I was taken to another doctor, this time at the Kinzua Vet Clinic. Dr. Bergenstock x-rayed my legs and checked me over too. Both doctors concluded that my legs were just fine the way they were. If I needed any kind of procedure to help me walk, they would have done whatever they could, but that wasn’t necessary. I was spayed and given all my vaccines. When I got back to the shelter, I was bathed and primped, and was now ready for my debut in the Warren Times Observer. I was a front page star, with my photo and story for everyone to see. Many people with good homes wanted me, but Paul and Karen really stood out. They were “over the moon” in love, they said. Karen, my new mom, bought me lots of gadgets and things to help me walk better. There were ramps, special beds and a buggy. The next step was being approved by my two new sisters. The first couple of meet and greets were not tail wagers let’s say, but then we jumped in with both feet (no pun intended) and I was officially adopted on January 15, 2019. I have the best mom and dad ever, and I love my two sisters. PAWS says I will always have a special place in their hearts. I am happy they helped me on that warm day in September. It has been an exciting journey for me. As I was not able to go into just any situation, PAWS worked hard to help find the perfect match for me. It took five months from coming to PAWS to being adopted by my new family, I’m happy PAWS gives pets like me as much time as we need to find a furever home. Now I have a Mom, Dad, and siblings (both human and canine) who love me and I love them. For me, thanks to PAWS, life is Sunny! Pets like Sunny come to PAWS frequently in need of veterinary and special care. Consider Sunny and all the others that need our help physically and financially to give them second chances. 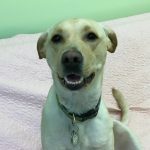 When you think of WARREN GIVES, remember Sunny, the care and help Paws Along the River provides pets in Warren County. Click here to see Sunny’s full story, more photos and other stories about the animals PAWS has helped over the years!